Although Turkey has a thriving tourism industry, bringing millions of visitors to the country every year, there is a downside to this success. Much of the hype and attention comes from the coastal beach holiday resorts of the Aegean and Mediterranean, which due to the weather only operate from the months of May to October. Outside of these months, hotels, bars and restaurants close up and tourism figures drop drastically, but there is light on the horizon because Lake Abant Nature Park in the Bolu district is rising in popularity to become a year-round tourism hotspot. The nature park has the distinct advantage of blooming in its full beauty throughout the four seasons. The freshwater lake, formed by a landslide homes many species of flora and fauna, so spring is naturally a time of rebirth when the landscape is a stunning kaleidoscope, combined with the gentle scent of newly bloomed flowers. Heading into summer, the daytime temperatures enjoy a welcome relief from the lakeside breeze, while the natural autumn earthy colours of red, orange, yellow and green, lure novice and experienced photographers searching for the perfect landscape photo that will boost their portfolio. By the time the snow settles, Lake Abant Nature Park has become a winter wonderland. Lake Abant Nature Park isn’t about adrenaline sports or exploring historical sites. It doesn’t offer sunbathing spots or vibrant shopping and nightlife scenes. The emphasis is purely on Mother Nature, and 7 kilometre s strolls around the lake. Those that don’t like walking can hire a bike or sign up for horse and carriage tours, and this slow-paced lifestyle is an attractive lure for city dwellers looking to unwind and de-stress naturally. Lake Abant Nature Park is three hours from Istanbul, so if you are coming from there, or Ankara, you won’t have the full opportunity to go at a slow pace which is the whole point of visiting. For this reason, an overnight trip is ideal because a few hotels are shore-side or nearby and most offer perfect landscape views. For a touch of luxury, the Abant Palace takes the stress away from parents with their onsite kid’s club and spa centre. Offering Turkish and international cuisine, it also does the al-a-carte option. Likewise, with the Buyuk Abant Hotel, who has a wooden platform, looking over the lake, making it the perfect place for breakfast or a nightcap. 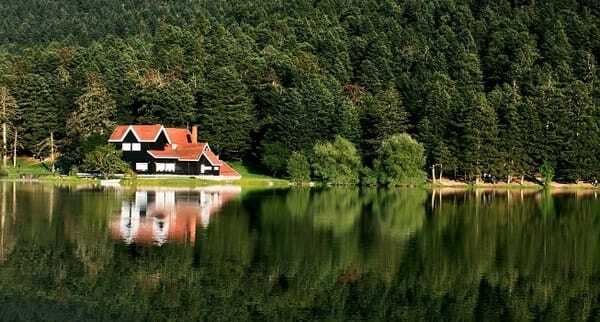 Lake Abant Nature Park sits within the district of Bolu, belonging to the black sea region. 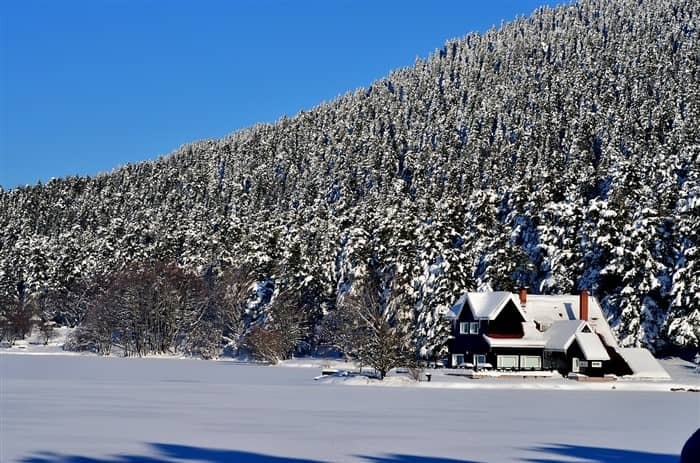 This has prompted many workers in the nearby bustling cities of Istanbul and Ankara, of which are the first and second biggest metropolis in the country, to look at property for sale in Bolu, as either a holiday home or potential retirement house for the future. The lure from city life that never stops, to a place of nature, is of course too much to ignore. With apartments for sale in Bolu city starting from as little as $50,000, it has also attracted the attention of many Middle Eastern nationalities, who are seeking a cheap overseas property investment. Outside of the main city centre, several small villages offer perfect landscape views to wake up to, and to finish the idea of a dream home, buyers can even tailor make their own villas, as seen in the example of these Bolu homes for sale, designed to blend in with the natural landscape. Alternatively, several land plots are available throughout the area with bespoke designs for modern, luxury homes in Bolu, complete with all the mod cons of living such as en-suite bathrooms, fitted wardrobes and smart home systems. Combining the beauty of the Bolu district with all the features and amenities that make a home comfortable, provides a welcoming and relaxing atmosphere whether it is for a family, or for couples, who adore this area for a romantic getaway. Since 2014, interest in property for sale in Bolu has grown, and it doesn’t look like it has any intention of slowing down. Find out more by looking at our portfolio of property in the Bolu district of Turkey. In this property buying guide, we present a brief introduction of the Istanbul market, highlight key investment areas in both the Asian and European sides that are growing in popularity, and have mass potential for capital appreciation.